I love the holidays. Kicking off with Halloween, on through Thanksgiving, and finally winding up with my favorite: Christmas. I love (almost) everything about the season. I love the sights, the sounds, the smells, the foods. I love shopping. Well…sort of. I love finding the perfect gifts for friends and family; I don’t love fighting the crowds and trying to figure out what the heck to get my aunt *this* year. Every year I tell myself that I won’t wait until the last minute. I want the days leading up to Christmas to be relaxing and fun, not stressful and frantic. I picture leisurely wrapping of presents while sipping eggnog, not fighting for the last parking spot in the entire mall lot. Luckily, this year, Best Buy is here to help! 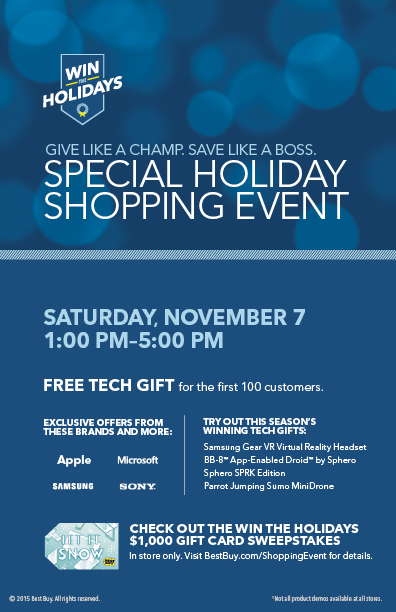 They are having their Best Buy Special Holiday Shopping Event on Saturday, November 7, from 1-5 p.m. (in select Best Buy stores). This is the perfect event to get me started on shopping early for once! If none of those float your boat (or even if they do), there will be experts on hand to answer questions and guide you to that one-of-a-kind holiday gift. (I may be asking Santa for a new iPhone!) Between the great gift choices, prizes, the awesome customer service and the chance to win a $1,000 Best Buy Gift Card*, this event has everything a relatively early-bird shopper could hope for. See you there! * To enter, simply tweet a selfie you’ve taken with the designated cardboard cut-out located at a participating Best Buy store with the hashtag #WinTheHolidaysSweepstakes between 1 p.m. ET and 8 p.m. ET on 11/7/15. I am struggling with what to get my husband this year, so I should stop by and see what recommendations they have for me. I hope I make it to the first 100. I am thinking of getting my husband a tablet. This is a really awesome promotion. I think I’ll have to make a point to get down there and be the first 100! I like the idea of shopping early. I buy a lot of stuff for my husband and son from Best Buy. This sounds like an amazing shopping event. My husband loves Best Buy. It makes it easier for me to buy him gifts. This sounds like a great day to get some of my holiday shopping out of the way. I may have to bring my boyfriend along too. I always do my holiday shopping at Best Buy. Who doesn’t want new tech for the holidays? This sounds like a great event. I’d love to be one of the first 100 there! Best Buy has the best holiday gifts. I love shopping Best Buy for our holiday gifts. I think this shopping event sounds like a lot of fun! Sounds like a really great event. I was just at Best Buy the other day, I have some stuff I need to get there for this Christmas! 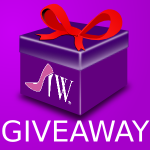 Thank you for sharing this event with us and the contest as well. I was at Best Buy yesterday and they were getting ready for this. Cannot wait to see what they have to offer! I need to send hubby up there right now to take advantage of this. We are looking for gaming systems and this would be a great way to get our shopping started. I’ve been planning trip to Best Buy to start buying our sons’ Christmas presents. I think this might be the perfect time to go. Best buy is an amazing place to shop at. They have a great selection of products to choose from and the staff is always so knowledgeable. I am pumped for all of the holiday shopping. Best Buy is definitely on my list of places to hit. Best Buy has been one of our favorite places for shopping & this event sounds so much fun where you could get some best deals during the Holiday shopping. It would be so nice to be one among the first hundred!